The war of words have begun in Port Harcourt between fans of Dolphins and Sharks as the derby day approaches. 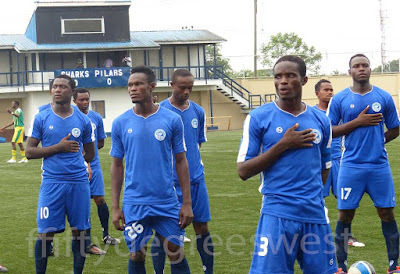 Both teams go head to head on Sunday at the Sharks FC Stadium in a game that will have a role to play in whether both sides remain in the Nigeria Professional Football League next season. Both sides need to win the game, but a draw will favour Dolphins more since they are the away side and currently are above Sharks on the log. Telema George says he has been a fan of Sharks all his life and he told DolphinsFC Media that only one result is possible on Sunday and it will be a win for his side. “Sharks are in a bad position now and do not need to drop points at home. We need the three points badly to escape relegation and I am sure we will win on Sunday against Dolphins,” Telema George said. Agwu Augustus, a member of the Dolphins Supporters club shared his optimism that Sharks will lose on Sunday. “We are going to beat Sharks. It’s a local derby and it is unpredictable but with the caliber of players we have I am optimistic we will defeat Sharks,” Augustus said. Looking at the recent exchanges between both sides, Telema George admits that Sharks fear Dolphins but says he will pray to God so his side can win. “We look on God and we are praying. We always have the fear of Dolphins because when you compare both of them, Dolphins have a better head to head record compared to Sharks,” Telema George said. Agu Augustus on his part admits it will be a tough game, but Dolphins will win and escape relegation at the end of the season. “It will be a tight match, but we will win. With the caliber of players we have I don’t see why we won’t win,” he said. When both sides played at the Liberation Stadium in the first round of the league, it ended 1-1, Yusuf Jaiyeola opening scores for Sharks and Godbless Asamoah getting the equalizer with three minutes left to play. Make dem leave talk for market women jare. We don't want a drab game this weekend. But an entertaining free-flowing game with goals too.